Conference Report: Forced Labour, Confinement and Represssion: European, Imperial and Post-Colonial perspectives. 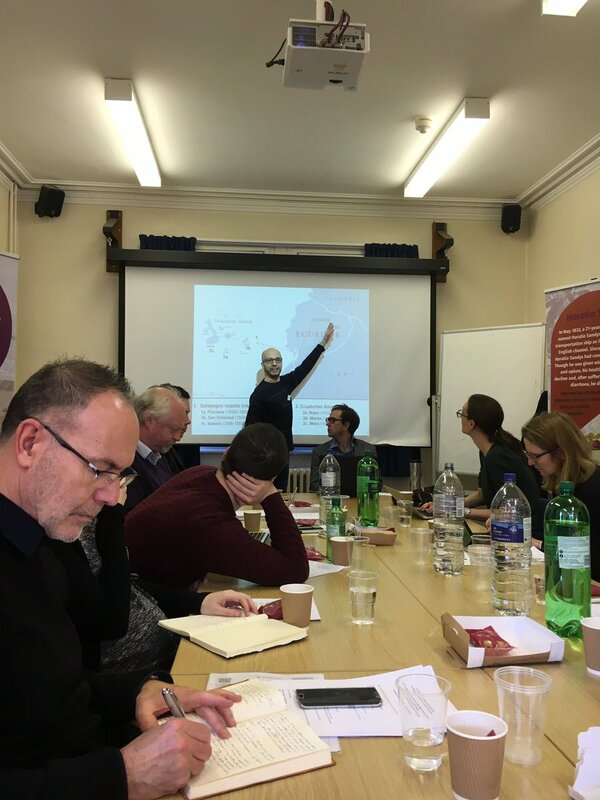 Two weeks ago, a joint workshop on ‘Forced labour, confinement and repression: European, Imperial and Post-Colonial Perspectives’ was hosted by The Carceral Archipelago project and The Stanley Burton Centre for Genocide and Holocaust Studies, both at the University of Leicester. Our aim was to bring into dialogue practices of coercion, confinement and forced labour in the colonies (19th– and early-20th centuries) and Europe and the USSR (twentieth century). These were exemplified in Dirk Moses’ (Sydney) public lecture for Holocaust Awareness Week on the topic: ‘The Colonial Origins of Nazi Genocide’. Professor Moses discussed the colonial modalities utilised by Nazi officials in designing and justifying genocidal tactics in Germany, and Eastern Europe. The workshop that followed brought together experts on British Africa, Canada, Germany, Ecuador, India, Kenya, New Caledonia, Spain and the USSR to discuss the connections, continuities and disjunctures between European, Russian and colonial practices of forced labour. If you want to see a summary of each paper’s main points, then please see the excellent Storify here (thanks to Adam Barker, aka @AdamOutside). 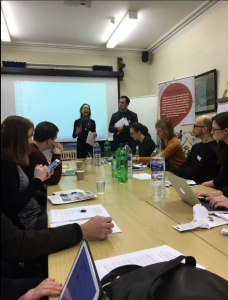 Instead, this blog will instead draw together some of the themes that ran through the papers which particularly stood out to me, and were prompted by the excellent comments of our discussants (Svenja Bethke, Clare Anderson and Dirk Moses). The papers encouraged us to see the way in which prisons were part of wider carceral landscapes, and to pay particular attention to the movements of convicts, internees and others between myriad systems of coercion. Whether it was the combination of confinement in penitentiaries and the transportation of convicts to frontiers in Ecuador from the nineteenth to twentieth centuries (Christian De Vito, Leicester), or the way in which penal regimes overlapped that were aimed at Indigenous Kanak people and indentured labourers and (ex-)convicts within the penal colony of New Caledonia (Isabelle Merle, Aix-Marseille). Adam Barker (Leicester) encouraged us to think about reserves as a form of carceral space that was used to immobilise and isolate Indigenous populations in North America, without using visible technologies of confinement (like walls or fences). Instead bureaucratic control of movement was used via a ‘pass-system’ which funnelled Indigenous people within a (semi-carceral) complex that included industrial schools, prisons and urban segregation. 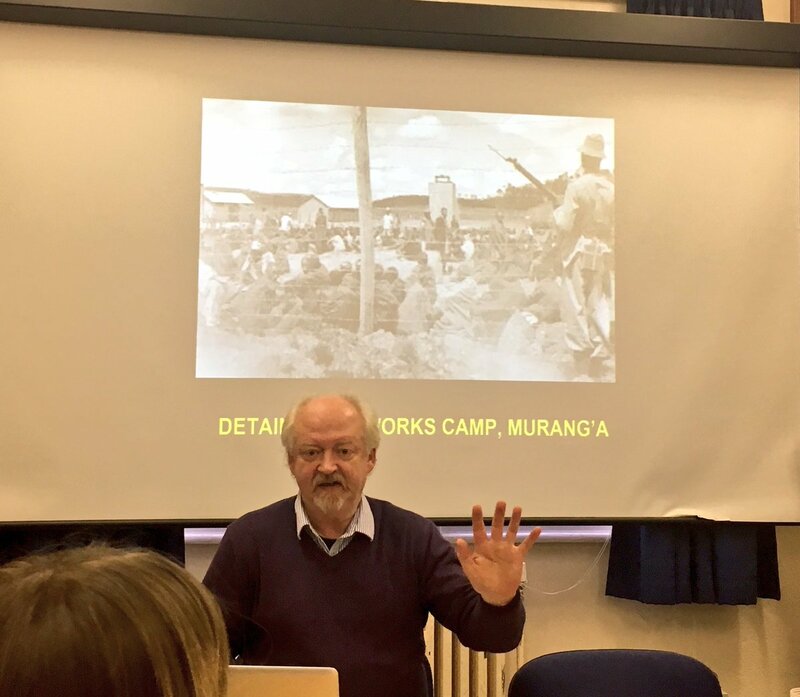 Mobility could also be a meaningful form of agency for internees – and this could include the smuggling of goods into Kenya’s detention camps, via warders (David Anderson, Warwick). Penal sites were rarely enclosed; they were permeable to the spaces and societies that surrounded them, in ways that were both coercive and potentially liberating. The workshop was a unique opportunity to bring together scholars who would usually not meet, thanks to the scholarly separation of regional specialisation. What became abundantly clear during the workshop was that the ideologies of punishment, confinement and forced labour were borrowed and adapted from other countries, but that this was balanced by the local and regional circumstances. David Anderson (Warwick) discussed circulations of policemen throughout British world who were staffed Kenyan detention camps. But equally significant were the African warders considered ‘safe’ by guards, who were problematic in practice in two respects: First, they couldn’t understand the prisoners, so couldn’t stop collective action. Second, they sided with Mau Mau prisoners and smuggled goods in for them. Julius Ruiz (Edinburgh) discussed the surprising parallels between Republican and Francoist forced labour regimes in Spain between 1936-45, which both aimed to ‘rehabilitate’ the Spanish into their preferred type of citizen; a notable difference between them, however, was how Republican labour camps incorporated Catholicism into their ideology of transformation by labour. Dan Healey (Oxford) discussed how gulag-doctors created a carceral research cluster, with links to broader fields of nutritional science, particularly in the US, in a bid to turn ill and disabled prisoners into productive labourers in the Soviet system. 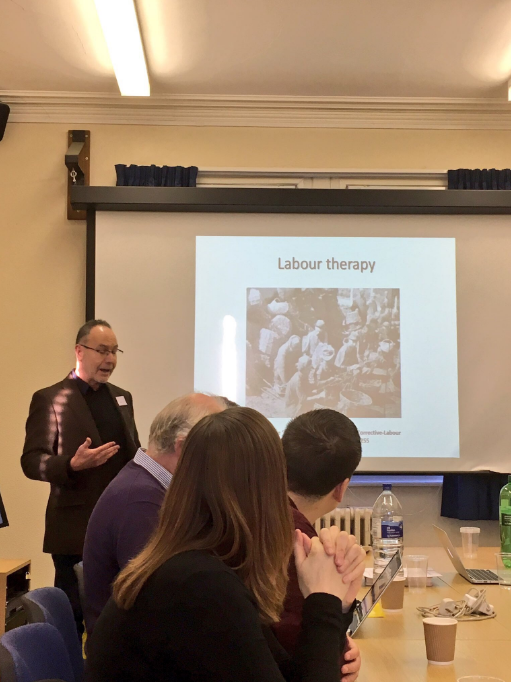 Paul Moore (Leicester) discussed how the German administration saw the predecessors to German labour camps of the early-1930s in Soviet Labour camps. Equally, the prisoners of these camps deliberately framed their experiences in transnational perspective: comparing themselves to Ancient Egyptian slaves to highlight both the injustice and the ‘anti-modern’ nature of their incarceration. The ways in which people and ideas circulated across national borders is essential for us to understand broad continuities across time and space in practices of confinement and coercion; this also helps illuminate how prison regimes were adapted to specific local circumstances. The sentence of ‘hard labour’ was explicit in the sentences of common criminals and many political prisoners. Labour was a key part of the punishment, designed to be physically taxing, and not always productive. For example, in German labour camps tasks included digging holes, piling up stones or dragging steamrollers; another task designed to invoke physical revulsion was cleaning the latrines by hand. 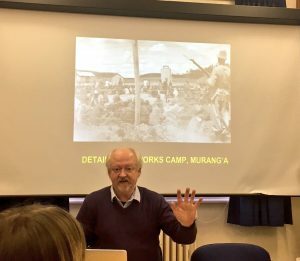 David Anderson (Warwick) spoke about how labour regimes and violent repression became intertwined, as escalation of punishment against ‘malingering’ (avoiding work) ultimately resulted in the routine use of torture against Mau Mau prisoners. On the other hand, Taylor Sherman (LSE) discussed how the bureaucratic labour and logic of colonial administrators enabled communal violence to continue. Officials worked to quantify communal violence on the basis of ‘balancing’ the numbers of Hindu and Muslim offenders and victims, rather than addressing its underlying causes. On the other hand, even labour that was designed primarily to be rehabilitative or productive, could be seen as a form of psychological coercion (if not violence). Stacey Hynd (Exeter) encouraged us to think critically about our definitions of forced labour; did the ‘retraining’ of African peasants in farming (as part of sentences for tax-defaulting) count as hard labour? Equally, did teaching juvenile delinquents carpentry and making them to build their own dormitories count? Certainly Hynd’s quote from an angry and emotional young prisoners suggested he felt this coercion was an act of violence against his freedom. In sum, during this workshop we took a whistle-stop tour of huge range of case-studies but were still able to reflect critically about the ideologies and logics, everyday practice, and lived experience of those involved in systems of forced labour an confinement. We saw carceral sites emerging at the intersection of transnational, national and local ideologies, which were often profoundly gendered and/or raced. They also emerged due to the mobility of officials, doctors, guards, indigenous peoples, indentured labourers and the prisoners themselves. We understood that labour could be simultaneously part of a strategy of corporeal and mental violence – of forced transformation – and that prisoners could choose to ‘transform’ the labour’s purpose on their own terms (by taking pride in it, or resisting doing it at all). Ultimately it was these glimpses of agency that I will remember in years to come. *Please note that this is my interpretation of others’ presentations on the basis of notes I took on the day, so any errors in interpretation are entirely my own and not those of the scholars mentioned. Leave a Reply to Christie Click here to cancel reply.